A UCL researcher is leading a phase 3 trial involving more than 1,000 people with MS to investigate whether simvastatin could become a treatment for the condition. The trial will test simvastatin, a cheap cholesterol lowering drug, in people with the secondary progressive form of MS. There are currently no licensed treatments that can slow or stop disability progression in people with this type of MS. The research will be led by Dr Jeremy Chataway (UCL Institute of Neurology), who led the phase 2 trial into simvastatin that was published in The Lancet in 2014. It involved 140 people with secondary progressive MS. The research found those taking high doses of the drug had a significant reduction in the rate of brain atrophy (brain shrinkage) over two years and also had better disability scores at the end of study. 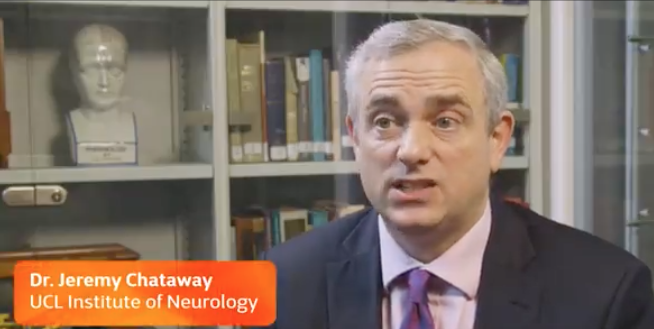 Dr Chataway said: "This drug holds incredible promise for the thousands of people living with secondary progressive MS in the UK, and around the world, who currently have few options for treatments that have an effect on disability. This study will establish definitively whether simvastatin is able to slow the rate of disability progression over a three year period, and we are very hopeful it will." Michelle Mitchell, Chief Executive of the MS Society, said: "We're incredibly proud to be co-funding the simvastatin trial. This is a momentous step forward in our quest to find an effective treatment for progressive MS. More than 100,000 people in the UK are living with MS and this research will offer a huge amount of hope to the majority of them." MS attacks the nervous system, it's often painful and exhausting and can cause problems with how we walk, move, see, think and feel. The condition is unpredictable and different for everyone. Stuart Nixon, who lives with secondary progressive MS, said: "At the moment people like me are living with the prospect of our condition getting worse each day. This is the most exciting opportunity to change how we manage progressive MS. It would be amazing if this trial can show that an existing drug, costing just a few pence a day, can help with MS."